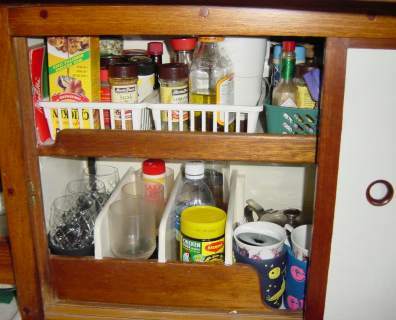 This section will provide some helpful storage tips for provisions and general information on how we deal with a variety of problems regarding food and storage. It is not intended to cover all elements of Provisioning as that subject has been sufficiently covered by many other sources. Please check the Recommended Sources category below for those we recommend on the broad subject of Provisioning. 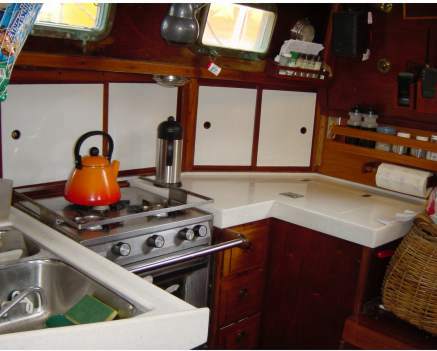 As you can see from the picture at right, Long Passages has a typical U-shaped galley with the icebox on the right in the picture and the sinks on the left. Behind the stove and icebox are several lockers for storage of dishes, glassware and provisions. The counter surface is a Corian-like material installed in Singapore. To read about this project, see Galley on the Boat Changes page. Dry Storage - Our lockers have sliding doors with one shelf on which to place provisions. One problem, of course, is when a door is slid open, items tend to shift and/or fall out, especially if we are on a starboard tack. 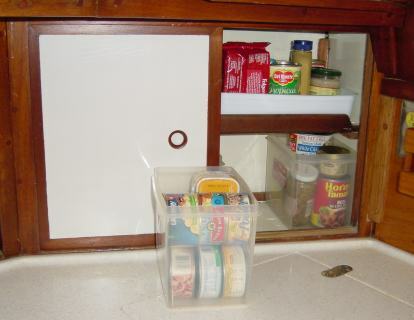 Here are some ideas that we used to organize and increase our storage of provisions. Ouch! That fell on my toe! - Place items such as cans, jars and packets in high, clear plastic containers that fit snugly into the locker or on the shelf. These containers hold the items in place and allow you to see what's there. 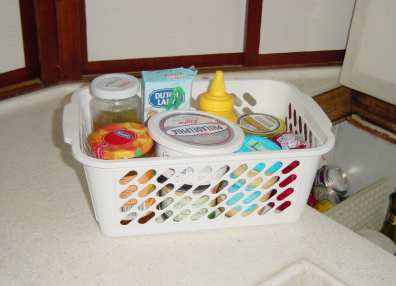 To get something out, just slide out the container, take out the item and then slide it back in place. 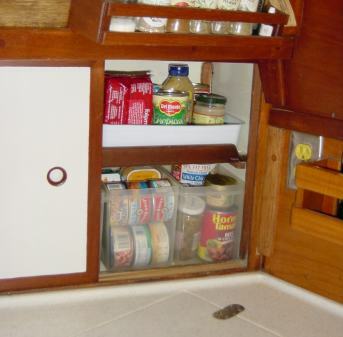 We do lose some storage space, but it is worth the small loss to avoid unidentified flying objects in the galley. Rubic's Cube - Also use round plastic containers to store things as well. It's sort of like a puzzle, you will have to experiment with several types of containers to get the best fit for your storage area. That sound is driving me crazy!! 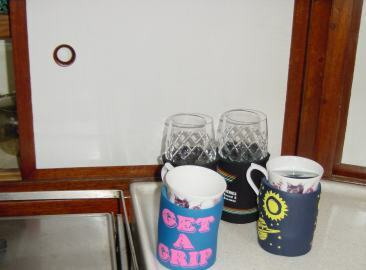 - One way to stop "clinking" of items in the lockers and protect real glass items such as wine glasses, teacups and coffee mugs is to place them in soft, rubber insulated containers ("coolie" cups). If the handle won't fit, cut a small slit on one side for it. This also solves the problem of where to store the "coolie" cups. Where's the coffee? 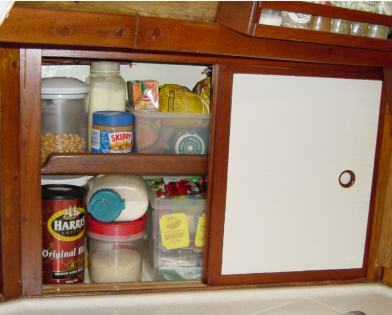 - The galley lockers are used to store those items that I use frequently, such as coffee, tea, spices, peanut butter, sugar, rice, pasta, popcorn and cans of tuna. Before we start a passage, I move the things that we will require on the passage from the long-term storage areas (under and behind the settees) to the galley lockers, thereby, making them a lot easier to get to. 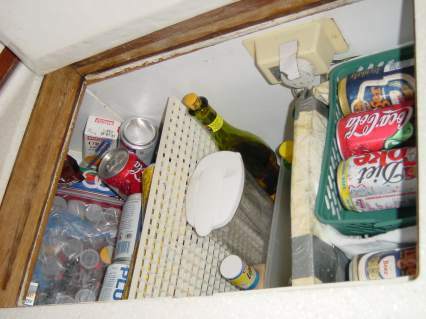 Icebox Storage Like many cruisers, Long Passages has a small icebox to chill drinks, vegetables, meats, condiments, etc. It is just an open box with an opening in the counter top. 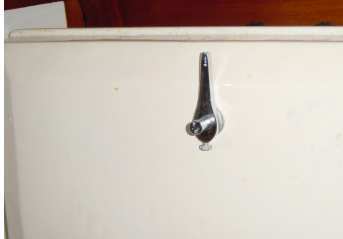 An Adler Barber Cold Machine unit with a small "freezer" compartment is used to chill the rest of the box. Bottom fishing - Whatever I wanted was always on the bottom and that meant I had to move or take out several things to get to the one thing that I wanted. A nuisance when stationary, but is a real "pain" when you're underway. 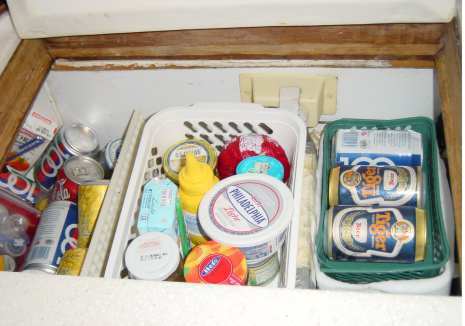 Frozen goods - Finally, whatever we placed next to the freezer box, including sodas, milk, vegetables and the like froze solid. Segregate freezer - We created an insulator of 1 inch thick styrofoam sheet. This was cut to size, covered with plastic and placed alongside of the freezer box to enable us to place things next to the freezer without them freezing. Containerize - Again, I used a variety of plastic containers which fit together in the box to hold the contents. Now, I can select one item out of the icebox without everything else moving into the empty spot. Also, the containers are placed one on top of the other, so if I have to get to something on the bottom, I just lift the upper container up or take it out completely to get to that item. Partition icebox - Lastly, we used a sheet of stiff plastic grating, cut to size, fitted into slots built onto the 2 walls, to partition off the icebox. This allowed us to separate the interior of the box from the part next to the hull. I can then stack cans of sodas, and many other things that I know do not need to be ice cold in that section and know that these things will not fall into the middle of the box. 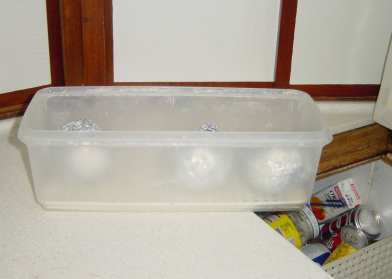 Icebox Organization - I have found that the following organization in the icebox works best for us in the tropics. Ice and meat in freezer unit - Since we do not have a separate freezer on LP, we use the small freezer unit in the icebox to freeze meats. Sadly, it is not cold enough to store ice cream. 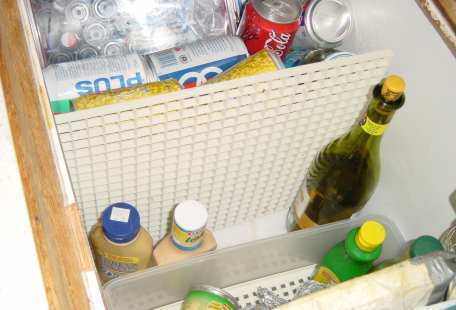 A small plastic basket is placed on top of the freezer unit. 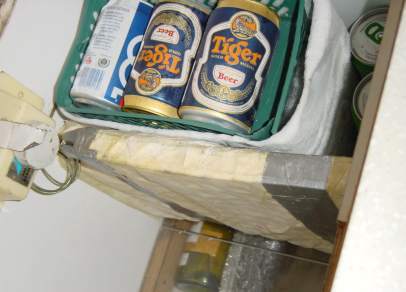 This helps to keep the cold air in when the lid is opened and I usually place a few cans of beer there to get them really cold. Cool items along the hull - On the hull side of the grating, we have 2 containers of film, sodas, beer and other things that do not have to be ice-cold. These things can be stacked up as high as the grating without fear that they will spill over into the rest of the icebox. Since we have used this system of partitioning and layering, we have doubled the useable space in our icebox and made it much easier to get to things. Icebox Locking Closure - In our continuing quest to make the boat safer at sea, we modified the icebox lid and side-wall and installed a turning-lock lift handle - the kind that is usually used to lock cabin sole boards in place. 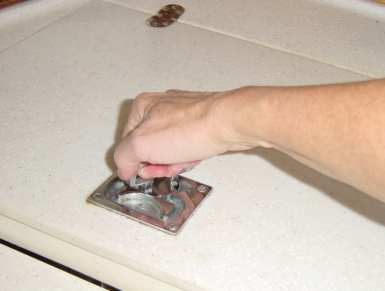 When the lid is closed and the handle of the lock is down, the lid cannot come open, even if we "turn-turtle." To open the lid, simply raise the handle, turn it to the side and lift. Preventing Weevils in Food - There are several ways of preventing weevils in pasta, rice and flour products. Some people swear by placing bay leaves in the food item, others microwave them, if possible. My method is easy and has not failed me in 10 years of cruising. I freeze the item (for 24 hours, if possible). If there are any weevil eggs in the item, the freezing will kill them, so they will not hatch. Since my freezer is small I use a variety of techniques to do this. If the item is small, say a bag of rice, I just put it in our freezer unit overnight. If we are in a marina with a restaurant, I ask the restaurant manager if I can place my grocery items in their large freezer overnight. I have never been refused. Once when we were moored off of Club Nautico in Cartegena, Columbia, I placed my pasta, rice and flour items in a plastic bag in their Ice Cream vending machine (with Norm's permission, of course). Remove the items from the freezer, let them "thaw" for 24 hours and then decant into an air-tight plastic container or Zip Loc bag. General - The section below lists some miscellaneous tips that we have found useful for food storage and preparation. Wrap citrus fruit in aluminum foil to prolong freshness. Do NOT store potatoes and onions together as the onions will cause the potatoes to rot. This next tip, I have found invaluable. Since I am not really keen to bake bread, especially in the tropics, I keep several packages of unrefrigerated Tortillas on board. When we are out of bread, I use them just as I would bread for sandwiches (I just warm them in a frying pan, first). If you have eggs, you can make Huevos Rancheros for breakfast and serve on the tortillas. I also make yummy cheese and jalepeno quesadillas for lunch. The tortillas can usually be found in most supermarkets, especially in New Zealand, Australia and even Singapore. I'm keeping my fingers crossed for Thailand. I usually use the El Paso brand, when I can find them. Please be sure to check the expiration dates and try to pick those that have the longest shelf life.